Often thought to be named for the famous Mingo Native American war leader, Johnny Logan, Logan County was actually named for Benjamin Logan, a Kentucky General who led a force against a group of Native Americans living in the Mad River Valley in 1786. Before the area became a county in 1817, the land was known as the Mad River Valley, and was heavily populated with various clans of Native Americans, but mostly by the Miami. They shared this beautiful stretch of country with Shawnee, Wyandot, Delaware, Ottawa, Mingo, and a few others. In the mid 1700s there were 12 to 15 Native American villages located in the Mad River Valley. When the Shawnee were forced from their homes in southern Ohio, many of them built new villages along the Mad River and these became known as Mac-A-Cheek towns. The capital of the Shawnee nation was established not far from what is now Zanesfield, which was at that time a Wyandot village. With the increasing numbers of American settlers moving into southern Ohio, conflicts between the settlers and the Native Americans grew in frequency and violence. An especially tragic conflict took place in Kentucky in 1782 as one of the last battles of the American Revolution. It became known as the Battle of Blue Licks and a number of Americans were killed, including Daniel Boone's son, by a group of 50 British rangers and 300 Americans Indians. Four years later, General Benjamin Logan led a group of American soldiers into the Mad River Valley. Among this group was Daniel Boone and Simon Kenton. His men burned the Shawnee villages and destroyed their food supply. A number of the Native Americans were killed or captured. One of those captured was the Shawnee chief Moluntha and his family. Although General Logan put the chief and his family under arrest, one of Logan's junior officers, Colonel Hugh McGary demanded to know from the chief if he was one of those present at the Battle of Blue Licks. Although the chief did not take part in the battle, for some reason, he gave the impression to McGary that he had been there. McGary was so outraged he attacked the Shawnee chief and killed him. Chief Moluntha's son, 14 year old named Spemica-Lawba was then raised by Benjamin Logan and became known as Captain Logan. He would later fight for the United States in the War of 1812. During that campaign, Captain Logan was with General Harrison. Harrison ordered him to scout ahead of a smaller expedition heading north along the Maumee River. Captain Logan was wounded, but made it back to where Fort Defiance was established a number of years before by General Anthony Wayne, where Logan died a few days later. 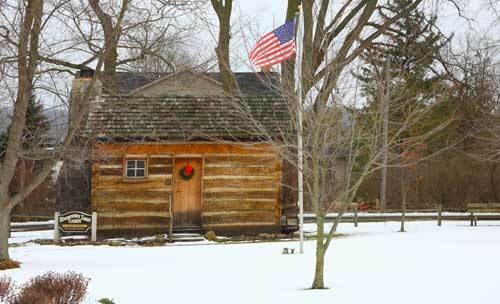 Captain Logan's body was then returned to Wapakoneta where he was buried with full military hones, the only Native American to receive that recognition in Ohio.